1997. Visualization 1,. Archery Focus 1, (5). 1998. Visualization 2. Archery Focus 2 (1). Dudley, John. Which arrows should I use for 3-D? Archery Focus 2 (4). Frangilli, Vittorio. Arrow selection. Archery Focus 6 (1). Frangilli, Vittorio. To tell limbs from limbs. Archery Focus 6 (L). Gerard, Mike. Recurve bow tuning tips. Archery Focus2(6). Kronengold, David. Sighting in Archery Focus4(2). Kronengold, David. Setting up compound bows-the easy way. Archery Focus 7 (2). Lueck, Gene. How to level your compound bow sight. Archery Focus 6 (4). (available free in " Complimentary Issue" at www.archerfiocus.com). McKinney, Rick. what type of fletching is best? Archery Focus 2 (2). Rabska, Don. Setting tiller for a recurve- Archery Focus 2 (1). Wise, Larry. Tuning your draw length- Archery Focus 2 (4). Wise, Larry. Using the back-tension release aid: parts I EE2. Archery Focus 3 (4-5). 2000. Coaching and sport psychology: Making your students mentally tough. Archery Focus 4 (3). Martens, R. 1987. Coaches' guide to sport psychology. Champaign, IL:Human Kinetics. Mastering Compound Bows (eBook, pDF format). All the technical aspects of shooting a compound bow with a release from champion archer James Park of Australia. Color photos, some showing the form of 2003 world champion and fellow Australian, Clint Freeman. Available on CDROM at www.archery- forum.com/afstore/product.lasso?id=7. Straight Talk from the Pros (Video). There is no better guide to shooting with a release aid than this video. Hear from top release shooters how the rise their release but also how they got into trouble and how they got out. Great footage of great shooters shooting with release aids. 68 minutes, VHS. Available from Carter Enterprises at 208-624-3467 or www.carterenterprises.com. Wise, Larry. Core Archery. The Master Coach and professional archer's latest book, Core Archery, is his long awaited missive on compound archery form. Available directly from the author at 1-800-464-9997. Wise, Larry and Helgeland, Glenn. (1998). On Target for Tuning your Compound Bow. Available directly from the author 1-800-464-9997. Clark, Nancy. 1998. Eating before competing . The Physician and Sports Medicine 26 (9). Dudek, Susan J. L987. Nutrition handbook for nursing practice. Buffalo, NY: J.B. Lippincott. Rowe, Ruth and Anderson, Allen. Simple Maintenance for Archery. 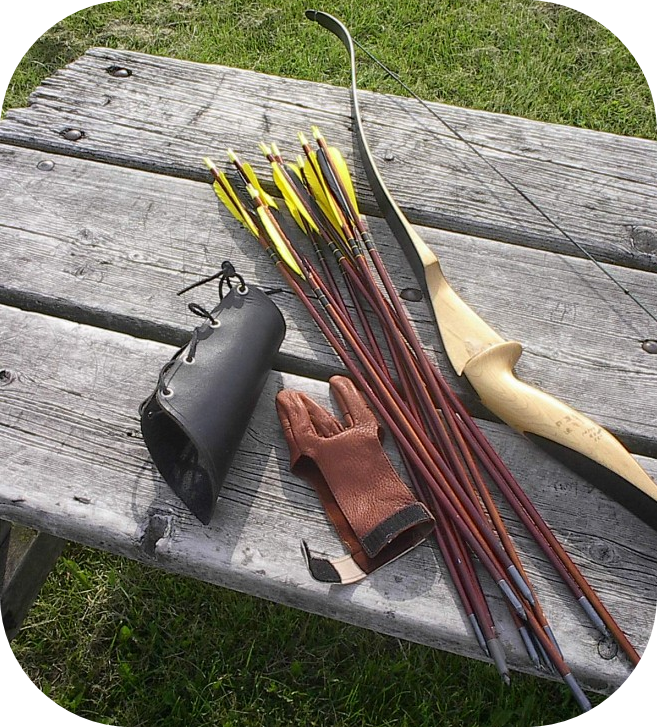 Everything you need to know about the basic maintenance of recurve and compound bows as well as arrows and other archery tackle. Highly recommended. Available from Archery Focus Magazine (1-800-671-1140) or www.qproductsarchery.com. Musta, Annette M. Strength training those "archery muscles." Archery Focus 4 (2). Musta, Annette M. The importance of being flexible. Archery Focus 4 (6). Musta, Annette M. Theraband exercises. Archery Focus 6 (5). Ertan, H., B. Kentel, S.T. Turner, and F. Korkusuz. 2003. Activation patterns in forearm patterns in forearm muscles during archery shooting. Human Movement Science, 22: 37-45. Gerard, Mike. Controlling your clicker Archery Focus 3 (3). Gerard, Mike. Controlling the pace of your shot. Archery Focus 4 (4). Lonsdale, Mark. Competition stress. Archery Focus 5 (4). McKinney, Rick. Conscious vs. unconscious aiming. Archery Focus 6 (2). Rabska, Don. Breathing for better performance. Archery Focus 3 (4). Rabska, Don. Developing the magic release. Archery Focus 5 (2). Ruis, Steve. Is the dead release really dead? Archery Focus 7 (2). Stonebraker, Rick. Finish the shot! Archery Focus 1 (4). Wilcock, Drew. Shot dynamics. Archery Focus 3 (3). Wise, L. 2004. Core archery: Shooting with proper back tension. Mequon, WI: Target Communications. Precision Archery. Editors Ruis, Steve and Stevenson, Claudia. 2004. This is arguably the best archery resource available. It is a collection of recurve and compound articles, everything from aiming, form, equipment maintenance, coaching, competition mental training, preparing for weather conditions and more. Pellerite, B. 2001. Idiot proof archery. Cahanna, OH: Robinhood Video Productions. Wise, Larry. (1994). On Target for Tuning your 3-D Bow. Available directly from the author at 1-800-464-9997. Franseen L.M. 1997. Relaxation is the target. Archery Focus 1, (3). Pelfrey, Ty. The fine art of trash talking. Archery Focus 5 (1). 2001. Does positive self-talk really work? Archery Focus 5 (6). Sport psychology interventions, ed. S.M. Murphy. Champaign, IL: Human Kinetics. Franseen, Lisa. Does positive self-talk really work? Archery Focus 5 (6). Franseen, Lisa. Making it routine. Archery Focus 2 (6). Franseen, Lisa. It doesn't hurt to ask about sports psychology. Archery Focus 4 (3). Gerard, Mike. Target panic-another view. Archery Focus 6 (5). Hellstedt,J.C. 1995. Invisible players: A family systems model. ln Sport psychology interventions, ed. S.M. Murphy. Champaign, IL: Human Kinetics. Nideffer, R.M. 1985. Athlete's guide to mental training. Champaign, IL: Human Kinetics. Weinberg, R. and Gould, D. eds. 1995. Foundations of sport and exercise psychology. Champaign, IL: Human Kinetics. American Council on Exercise. 1996-1997. ACE personal trainer manual, ed. Richard T. Cotton. San Diego: ACE. American Dietetic Association. Athletes fuel up for fitness and weight management. www.eatright.org. Rowe, Ruth. Fundamentals of Recurve Target Archery. Targeted toward beginning or returning recurve archers and coaches of such archers, this is a step by step, no nonsense approach to the right track. Every recurve archer would benefit from reviewing this material. Especially valuable for coaches. Available from Archery Focus Magazine (1-800-671-1140; or www.qproductsarchery.com. Mundon Tim. 2002. Shooting FITA field unmarked distances. Archery Focus 6 (3). Ruis, Steve. The very last word on shooting up and down hill. Archery Focus 3 (5). Pellerite, Bernie. Shooting in the wind and rain. Archery Focus 4 (2). Serralheiro, Pedro. Heat disorders. Archery Focus 4 (4). Serralheiro, Pedro. Stop the sun, not the fun. Archery Focus 4(5). Bassham. Highly recommended. Available at www.lannybassham.com. 1998. Don't read this article: Goal setting. Archery Focus 2 (2). 1998. It's all routine. Archery Focus 2 (6). Gould, D. 1993. Goal setting for peak performance. ln Applied sport psychology: Personal growth to peak performance, ed. J.M. Williams, 2nd ed., 158-169. Palo Alto, CA: Mayfield. Honda, S., and R.W. Newson. 1972. Winner or loser? Panorama City, CA: Illustrative Specialties. Landers, D.M., and S.H. Boutcher. 1986. Arousal-performance relationships. In Applied sport psychology: Personal growth to peak performance, ed. J.M. Williams, 163-184. Palo Alto, CA: MaYfield. McKinney, Rick. The simple Art of Winning. Available from Archery Focus Magazine (1-800-671-1140) or directly from the author at www.carbontecharrows.com. This is one of the very best resources for recurve bow shooters, especially if you shoot FITA freestyle. Every aspect of recurve archery is covered by the most decorated archer in American history.